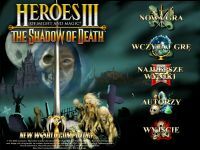 "Heroes of Might and Magic III: The Shadow of Death is the second of two expansion packs for the turn-based strategy game Heroes of Might and Magic III. It was developed by New World Computing for Microsoft Windows and released by the 3DO Company in 2000. Shadow of Death is a standalone expansion pack that includes the original game. The Shadow of Death campaigns serve as a prequel to both Might and Magic VI: The Mandate of Heaven and Heroes III: The Restoration of Erathia. The storyline revolves around Sandro the Necromancer, who has recently arrived on the continent of Antagarich following the events of Heroes of Might and Magic II. Sandro begins a ten-year plot to reassemble two ancient and powerful necromantic artifacts. He uses illusionary magic to take the form of a living human, which he uses to disguise himself." Source: Wikipedia, "Heroes_of_Might_and_Magic_III:_The_Shadow_of_Death," available under the CC-BY-SA License.